This is a blog we hoped we would not be writing. Last legislative session, after decades of lobbying and thousands of letters and calls from constituents, cruel live pigeon shoots should have been conclusively brought to an end. We were so close that we could picture the end of this cruelty. The bill to end live pigeon shoots had sailed through the Senate. We had enough support in the House and the Governor had publically stated that a bill sent to him would be signed into law; we just needed a vote in the House. Those of you who closely follow the live pigeon shoot issue know what happened: we were denied the vote – we didn’t lose – the House Majority Leader simply refused to allow the bill to be voted upon. He chose to deny his colleagues, and the citizens of our state, the ability to dispatch with this issue for once and for all. The session came to a close and the bill died. And now, as Labor Day marks the beginning of another season, thousands and thousands of birds are suffering. So many of us worked so hard last legislative session – and that is why we came so close. Scores of you pushed and pushed, calling, writing to and meeting with your legislators to elicit support of the bill to end live pigeon shoots, and responding to every action alert. Our bitter disappointment still feels overwhelming, but it is insignificant when compared to the impact on the animals. It is the animals who have sustained the overwhelming loss as a result of the death of the pigeon shoot bill last session. They are the ones who are suffering as we write this blog and continue to discuss this issue. While the cruelty associated with these contests is virtually inconceivable, the wanton inhumane disregard of the treatment of animals epitomized by live pigeon shoots has spawned a new low in behavior: the inhumane trapping and capturing of birds from the parks of New York and the streets of Pittsburgh, and elsewhere, to stockpile live targets for these shooting contests. Eye witness reports from Pittsburgh have described wings being broken and birds being roughly handled as they are snatched from the streets. The situation in New York may be even more heartbreaking, as pigeons are considered an integral part of the city’s character and the netting or trapping of birds is illegal. Nonetheless, in July, coinciding with the timing of a large Pennsylvania live pigeon shoot contest, hundreds of docile and trusting birds – birds who were fed and treasured by New York residents – were lured with birdseed and illegally scooped up in netting, presumably by pigeon brokers. For years, New Yorkers have complained that large quantities of their pigeons disappear in conjunction with the Pennsylvania live pigeon shoot circuit schedule, alleging that the very birds they care for and welcome in their parks are being stolen and used in these despicable events. What can we do amidst our frustration and such staggering animal suffering? Well, here’s what we can’t do: give up! Rather, we must harness our frustration so that it propels us to work even harder to secure the passage of a bill to end live pigeon shoots. The ongoing animal suffering must continue to galvanize us into action. 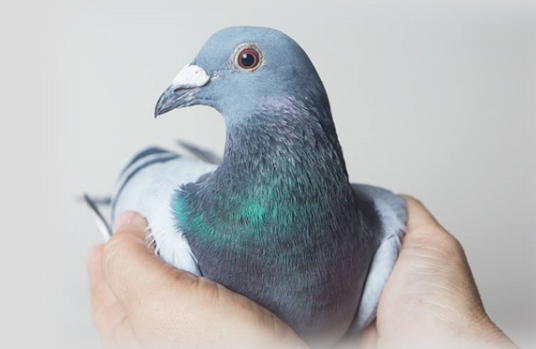 We came so very close to ending this atrocity last session and being within a breath of doing so must encourage us to believe and pledge that we can – and will – bring live pigeon shoots to an end during the 2015-2016 legislative session. It is just a matter of time now. On April 16, 2015, SB 715, the bill to end live pigeon shoots, was referred to the Senate Judiciary Committee, where it has essentially sat, while birds are being trapped, wounded and slaughtered. As the summer winds to a close and the session is poised to resume, we must recommit to working hard – harder than ever – to push the pigeon shoot bill. We must contact our legislators, especially our state Representatives, requesting support and movement of SB 715. We must all mobilize our individual and collective resources and energy to push SB 715 until it passes and is signed into law, and these shoots are clearly banned. After all, the animals – the docile birds captured from the parks of New York, the streets of Pittsburgh and elsewhere – are counting on us. The infamous Hegins Labor Day shoot has been over for nearly two decades. This Labor Day, we pause to reflect and recommit ourselves to never having to write this blog again. Please join us.